You can reduce your anxiety with Linda's help and support. 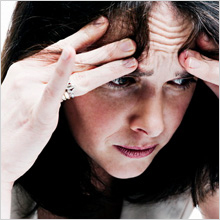 Linda has experience to help you get control of your anxiety and panic attacks. You can learn to reduce the effects of anxiety and avoid panic attacks by using Hypnotherapy, so call Linda today. Anxiety affects your whole being, on all levels - on a physical level, a behavioural level and on a psychological level. Physical level - rapid heart- beat, muscle tension, queasiness, dry mouth or sweating. Behavioural level - anxiety can sabotage your ability to act, express yourself, or deal with certain everyday situations. Psychological level - anxiety is a state of apprehension and uneasiness. This is its most extreme form and it can cause you to feel detached from yourself and even fearful of dying or feel as if you're going crazy. 3. change your negative thoughts (i.e. negative self-talk) which keeps you in a constant state of dread and worry, into a positive way of thinking. Anxiety can appear in different forms and different levels of intensity. It can range from a mere twinge of uneasiness, to a full-blown panic attack marked by heart palpitations, disorientation and terror. You can have a General Anxiety Disorder (GAD) or Specific Anxiety of any specific situation, experience or objects. Anxiety that is not connected to any particular situation and just comes out-of-the-blue, is called Free-floating Anxiety or a Spontaneous Panic Attack. Panic attacks are the uncontrollable increase in anxiety that triggers your fight-or-flight response. They usually occur unpredictably, can be quite severe and may be accompanied by a sense of dread, heart palpitations, sweating, trembling and a feeling of being out-of-control. Typically, they are short in duration, but fear of another attack may persist. When you can recognise the symptoms of anxiety, you will be able to take control of your emotional state and stop your anxiety before it becomes a panic attack. This is why hypnotherapy works so well at stopping panic attacks. During our sessions, I can help your mind learn to take control of its emotional state and remain calm and relaxed when it needs to be. Linda has produced a relaxation audiobook session available for download. Please click here to visit the Audio page for more information. Call Linda on 0779 4647442 to ask any further questions or to book an appointment.You can also contact us via e-mail and request a call back using the contact page.